Excess amino acids are converted into molecules that can enter the pathways of glucose catabolism. Amino acids must be deaminated before entering any of the pathways of glucose catabolism: the amino group is converted to ammonia, which is used by the liver in the synthesis of urea. Deaminated amino acids can be converted into pyruvate, acetyl CoA, or some components of the citric acid cycle to enter the pathways of glucose catabolism. Several amino acids can enter the glucose catabolism pathways at multiple locations. keto acid: Any carboxylic acid that also contains a ketone group. deamination: The removal of an amino group from a compound. Metabolic pathways should be thought of as porous; that is, substances enter from other pathways and intermediates leave for other pathways. These pathways are not closed systems. Many of the substrates, intermediates, and products in a particular pathway are reactants in other pathways. Proteins are a good example of this phenomenon. They can be broken down into their constituent amino acids and used at various steps of the pathway of glucose catabolism. Proteins are hydrolyzed by a variety of enzymes in cells. Most of the time, the amino acids are recycled into the synthesis of new proteins or are used as precursors in the synthesis of other important biological molecules, such as hormones, nucleotides, or neurotransmitters. However, if there are excess amino acids, or if the body is in a state of starvation, some amino acids will be shunted into the pathways of glucose catabolism. Connection of Amino Acids to Glucose Metabolism Pathways: The carbon skeletons of certain amino acids (indicated in boxes) are derived from proteins and can feed into pyruvate, acetyl CoA, and the citric acid cycle. Each amino acid must have its amino group removed (deamination) prior to the carbon chain’s entry into these pathways. When the amino group is removed from an amino acid, it is converted into ammonia through the urea cycle. The remaining atoms of the amino acid result in a keto acid: a carbon chain with one ketone and one carboxylic acid group. In mammals, the liver synthesizes urea from two ammonia molecules and a carbon dioxide molecule. Thus, urea is the principal waste product in mammals produced from the nitrogen originating in amino acids; it leaves the body in urine. The keto acid can then enter the citric acid cycle. 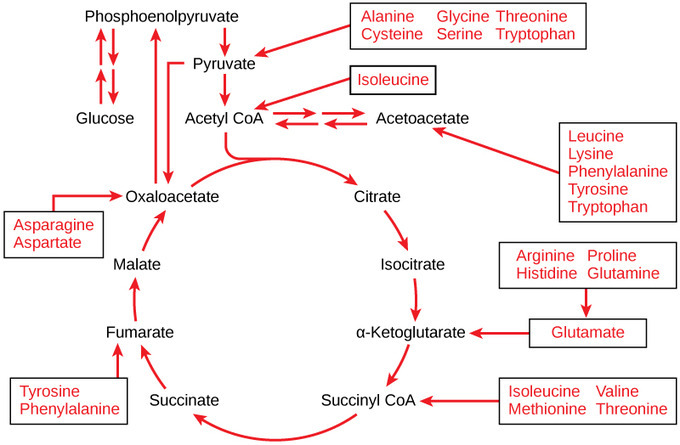 When deaminated, amino acids can enter the pathways of glucose metabolism as pyruvate, acetyl CoA, or several components of the citric acid cycle. For example, deaminated asparagine and aspartate are converted into oxaloacetate and enter glucose catabolism in the citric acid cycle. Deaminated amino acids can also be converted into another intermediate molecule before entering the pathways. Several amino acids can enter glucose catabolism at multiple locations.